Lavender Brown (c. 1979 or 1980 – 2 May, 1998) was a pure-blood witch, the daughter of Mr. and Mrs. Brown and a Gryffindor. She started her education at Hogwarts School of Witchcraft and Wizardry in 1991. Lavender as well as her room-mate Parvati Patil. In her third year, she began studying Divination, which she was fascinated by, and became friendly with Professor Sybill Trelawney, whom she respected a great deal. In her fifth year, Lavender joined Dumbledore's Army, an organisation taught and led by Harry Potter, despite initially doubting Harry's claims that Lord Voldemort had returned. During her sixth year, she dated Ron Weasley for a while, though they soon broke up. In her final year of schooling, Lavender joined the reconstituted D.A. to oppose Death Eater control of Hogwarts, and fought in the Battle of Hogwarts, during which she was killed by werewolf Fenrir Greyback. Lavender was born in 1979 or 1980 to Mr. and Mrs. Brown, two pure-bloods. She shared a dormitory with Hermione Granger, Parvati Patil and other two girls, and soon became best friends with Parvati. However, she did not get along as well with Hermione as she did with the other three girls. Hermione was believed by most to be a loner and made friends with boys rather than girls. There were also personality clashes between Hermione and the other Gryffindor girls; Hermione, being rather studious, may have been better suited with Ravenclaw girls. In her second year, Lavender was one of the students present in Professor Binns' History of Magic class when Hermione asked about the Chamber of Secrets; like the rest of the class, Lavender paid much more attention at this point, even rising her head off her arms. Lavender attended Professor Lockhart's Duelling Club, and when Lockhart was disarmed by Professor Snape, she handed him back his wand. It is likely that Lavender, given her common nature had a crush on Professor Lockhart, as did many of the other female students even including Hermione Granger, and would be shocked to discover he was a fraud at the end of the year. During her fourth year, Hogwarts hosted the Triwizard Tournament, a series of challenges for wizards to enter if they believed themselves capable. Harry Potter, who was in Lavender's year, was selected as a champion. As one of the traditions, the tournament held a ball and Lavender attended the Yule Ball with fellow Gryffindor student Seamus Finnigan, likely just as friends. That same year, when Care of Magical Creatures professor Rubeus Hagrid attempted to see if Blast-Ended Skrewts hibernate (which they do not), she stayed to help collect the runaways instead of fleeing into the hut like the Slytherins, and singed her robes in the process. Later that year, Barty Crouch Jr., in disguise as Defence Against the Dark Arts professor Alastor Moody, used the Imperius Curse on her in class, thus forcing her to humiliate herself publicly by imitating a squirrel. Hermione Granger was not impressed that Barty Crouch Jr. had the nerve to teach the three Unforgivable Curses in school and was appalled when he demonstrated them on students. She didn't come to the aid of Lavender when she was being humiliated, but she did stick up for Neville Longbottom when he was horrified by the demonstration of the Cruciatus Curse on a spider. At the end of the year, Lavender would attend the leaving feast, which was held as a memorial service to the late Cedric Diggory who was killed during the Triwizard Tournament. During this service, Albus Dumbledore took the liberty upon himself to inform the students of Hogwarts that Lord Voldemort was at large once again. In her fifth year, when Harry Potter announced the return of Lord Voldemort, Lavender, like many others, initially believed the Ministry of Magic propaganda that Harry was lying, much to her room-mate Hermione's irritation. On the second day of the school year, Ernie Macmillan's public of support of Harry and his claims seemed to force her to begin to question her own beliefs. It is possible that Seamus Finnigan, a fellow Gryffindor may have been putting doubts into her head also as he strongly supported the Ministry and Lavender was close with Seamus. However, despite the claims that Harry had been lying, Lavender was one of the first students to arrive at the Hog's Head for the first meeting of what would become Dumbledore's Army. When the D.A. practised casting the Patronus Charm, Lavender was only able to achieve puffs of silver vapour, and was becoming increasingly frustrated that she could not do it. Later on in the year, High Inquisitor Dolores Umbridge began inspecting the teachers of Hogwarts and Lavender was saddened when Professor Trelawney was temporarily sacked by Umbridge after her inspection, and even brought her some nice daffodils, though she continued to take the class under the centaur Firenze, upon whom both she and Parvati had a crush, despite him being half-man and half-horse. Lavender : "Friends, don't make me laugh", said Lavender scornfully. "She didn't talk to him for weeks after he started going out with me! But I suppose she wants to make up with him now he's all interesting...."
Harry: "Would you call getting poisoned being interesting?" The two dated for a few months, and were often seen kissing in public. For Christmas, Lavender sent Ron a necklace which read 'My Sweetheart', which he disliked immensely, and after the holidays, their relationship began to go downhill. Lavender was very upset when Ron was poisoned, and when he increasingly pulled away from her. He feigned sleep when she came to visit him, avoided her, and became visibly annoyed with her affections. Worried that her relationship with Ron was fading, she sought out the advice of his best friend, Harry Potter, whom she would talk to about Ron's feelings, making Harry feel uncomfortable. He also reconciled with Hermione and spent increasing amounts of time with her, making Lavender suspicious. After she saw Ron and Hermione leave the Gryffindor dormitory seemingly alone, since Harry was under his Invisibility Cloak, she ended their relationship, much to Ron's relief. She attended Dumbledore's funeral at the end of the year. Lavender fought in the Battle of Hogwarts, during which she fell from a balcony and was attacked by the werewolf Fenrir Greyback. Rushing to her aid, Hermione blasted Greyback away from her with a powerful spell, and Professor Trelawney dropped a crystal ball on his head. Immediately after the attack she was seen feebly stirring, but later died from her injuries. Lavender: "Friends, don't make me laugh," said Lavender scornfully. "She didn't talk to him for weeks after he started going out with me! But I suppose she wants to make up with him now he's all interesting...."
Lavender was a somewhat silly and sentimental girl, though she was also brave, as she was sorted into Gryffindor house and fought in the Battle of Hogwarts. She had a great interest in Divination despite the subject being "wooly" and had reverence for Professor Trelawney, even though she was something of a fraud. She was lively and loved to be the centre of attention, but tended to react in an extreme way to everyday situations, either laughing or crying hysterically and could be easily offended or emotional. She stood quite in contrast with the more pragmatic Hermione Granger. Charms: In 1996 Lavender along with Pavarti was able to cast the Locomotion Charm in preparation for their upcoming O.W.L. exam. She was also able to produce a non-corporeal Patronus, an advanced piece of magic. The two were often seen giggling and gossiping together during their school days, and shared a friendship with Professor Trelawney. Parvati became very uncomfortable with how seriously Lavender took her relationship with Ron Weasley in their sixth year, though the two remained to be close. Her reaction to Lavander's death is unknown, although she was likely devastated at the death of her closest friend. Harry: "Look, why don't you go talk to Ron about all this?" Ron: " [...] we don't really talk much. It's mainly [...] "
Lavender was very affectionate with, and possessive of, Ron, adopting the name of "Won-Won" for him and sending him a necklace for Christmas saying "My Sweetheart" on it, which he greatly disliked and was shocked that she would think it was to his taste The romance began to cool on Ron's end after the Christmas holidays, which Lavender noticed and was very upset by. She repeatedly pressed Harry Potter for details of Ron's feelings for her, and alarmed even her best friend Parvati with how obsessively she threw herself into the relationship. Lavender was infuriated when no one thought to inform her after Ron was poisoned, especially since Ron took to feigning sleep whenever she came to visit him in the infirmary, and reconciled with Hermione. After being released, Ron took to avoiding his girlfriend. Hermione: "I might ask you the same question!" Hermione: "Well, I happen to be his... friend." Lavender and Parvati were not nearly as close to their other room-mate, Hermione Granger, as they were to one another. Though the girls did not appear to dislike each other, they had very different interests and sometimes clashed as a result. For example, Hermione scorned Divination, Lavender and Parvati's favourite subject. She also became irked with Lavender for doubting Harry Potter's assertion that Lord Voldemort had returned in 1995. Although Hermione was glad when they broke up, she tried to spare Lavender's feelings by not being openly affectionate with Ron. She also came to Lavender's aid during the Battle of Hogwarts, blasting Fenrir Greyback away from her. During the Battle of Hogwarts, Trelawney attempted to save Lavender from being savaged by Fenrir Greyback by dropping a crystal ball on his head. However, during the course of the fighting, Lavender succumbed to her wounds. Lavender became a member of Dumbledore's Army during her fifth year. Dumbledore's Army was an organisation found by Harry Potter, Ron and Hermione, and led by Harry, in order to teach the students Defence Against the Dark Arts, something that professor Dolores Umbridge did not; thinking that the students would use their magic against the Ministry of Magic. Lavender is a type of flower, as well as a name for the pale shade of purple of the blossoms. In flower symbolism, the lavender can symbolize affection, cleansing, or concealment. The Ancient Romans used lavender to scent baths, and its name is derived from the Latin verb lavāre, "to wash". In Western culture, the colour lavender can sometimes be used to symbolize decadence and the enjoyment of sensuality. Interestingly, "Lavender" is a colour and her last name is "Brown", which is also a colour. Many fans speculate as to why Lavender Browns actress was changed for Half Blood Prince, the reasoning is quite simple. Before Half Blood Prince, Lavender Brown played no major role, she was portrayed by two separate actresses in the second and third film and was a background character. Background characters have no specific casting, which is why multiple people can portray them. Usually they are given character names just to keep order on a film set. 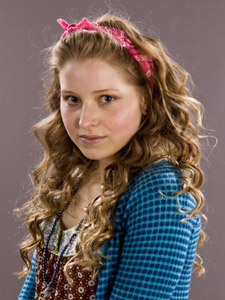 Lavender Brown, as a major character role, was not cast until the 6th film. And thats why her actress changes. The filmmakers had no way of knowing she would play such a role when they assigned her name to the background actresses from previous films. In the novel Harry Potter and the Deathly Hallows, Lavender Brown's fate after Fenrir Greyback's attack is left uncertain: she is last mentioned "feebly stirring" after the attack. The film Deathly Hallows: Part 2 is more clear about her fate, appearing to show her death outright, a fact confirmed in Harry Potter Page to Screen: The Complete Filmmaking Journey. ↑ Her blood status is given as pure-blood on the student list shown by J. K. Rowling on Harry Potter and Me. ↑ In Harry Potter and the Prisoner of Azkaban, when Gryffindor students in Harry's year are facing their Boggarts, three forms were not identified with any particular student, but must belong to the two unidentifed Gryffindor girls and to Lavender. This page was last edited on 4 July 2015, at 17:48. This text is available under the GNU FDL and may have been adapted from the Wikipedia article about Lavender Brown (history).